I talk about skincare on here quite a lot, but body care often slips through the net without getting much of a mention. However, for the past few months I have found myself trying and really liking quite a few new products for the body (and a few for the face), so thought a little roundup post was in order. Some are from brands I have loved for years, and some are from brands I have never used before... So sit back, enjoy and prepare to add a few new bits to your wishlist! 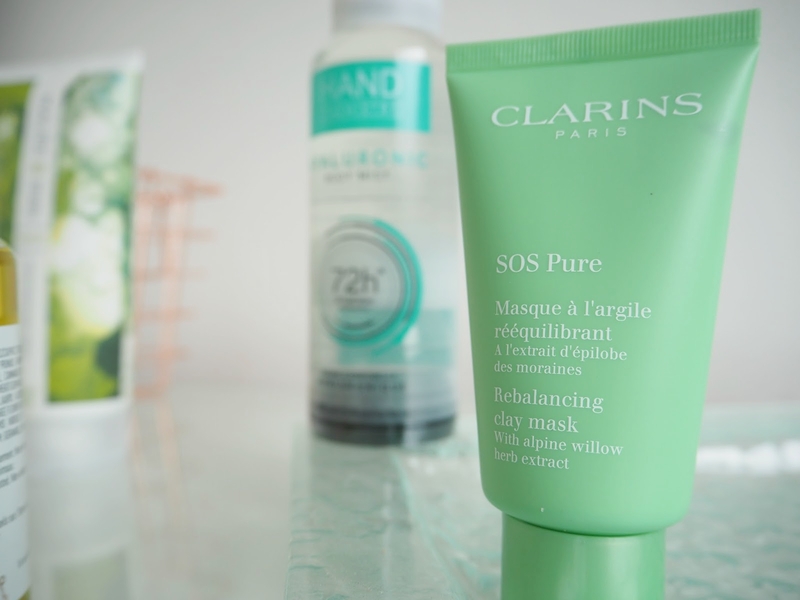 Clarins SOS Pure Mask: I feel as though 2017 has been the year of the face mask and one of my favourites that I've been treating myself with during my weekly pamper nights has to be this Clarins one. The SOS Pure mask is a rebalancing clay mask, which helps to absorb excess sebum, reduce shine and purify and mattify the skin. It contains alpine willow herb extract, perfect for those with oily skin. But wait Tor, don't you have dry skin?... I know that'a what you're thinking! Well, yes I do, but when my skin is feeling hormonal, I suffer from and oily chin and breakouts around my T-zone, which is when I reach for this mask... and let me tell you, I see instant results. The wonderful thing about this mask is that, despite targeting oil and those with troublesome skin, it does not dry my already dry skin out at all... It just kind of balances everything out, toning down the oily redness I suffer from and leaving me with a smoother canvas for my makeup. 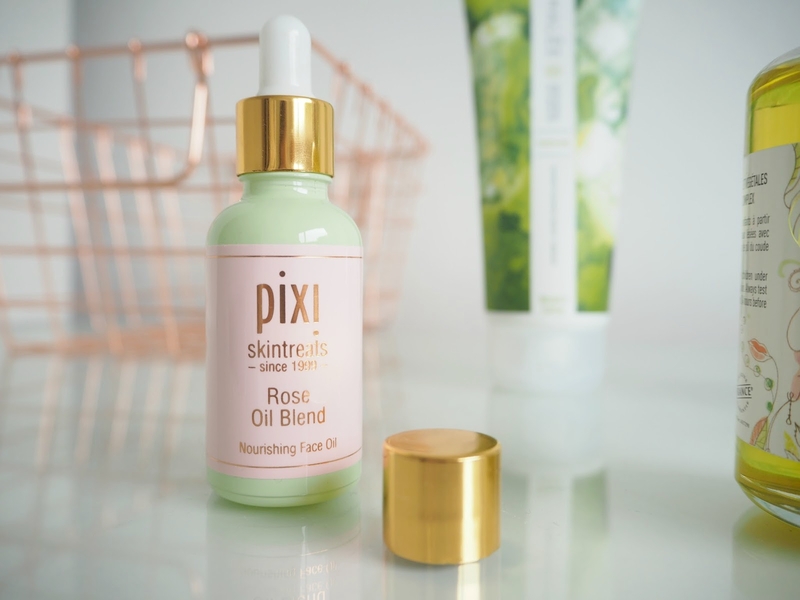 Pixi Rose Oil Blend: I'm a huge fan of Pixi products, and have been since the first time I made my way to their Carnaby Street store especially for a bottle of Glow Tonic, long before it was available anywhere else. Since then, their skincare range has developed immensely and the Rose Oil Blend has fast become one of my very favourite products to use in my skincare regime. As mentioned, I suffer from dull, dry skin and I constantly try new products that promise to brighten my skin, some with disappointing results and some which really help... This is one of the latter. The oil is so gentle, and works wonderfully for my sensitive skin, with ingredients including sweet almond oil, rosehip, jojoba, pomegranate seed and rose geranium oils, you can imagine just how nourishing and kind to the skin this is. I mix a drop in with my moisturiser each morning and massage into my skin after cleansing each night to give my skin a thorough intense treatment. Despite only having used this for around three weeks so far, I can't help but comment on how much softer and glowy my skin is feeling when I wake up. 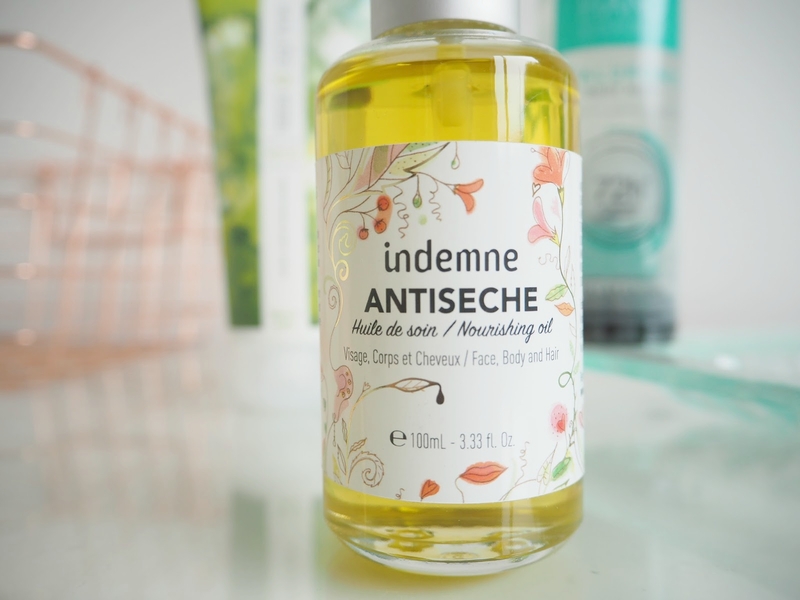 Indemne Antiseche: I was only introduced to Indemne products this year, and this is the second of their oils in my collection, and in this post. 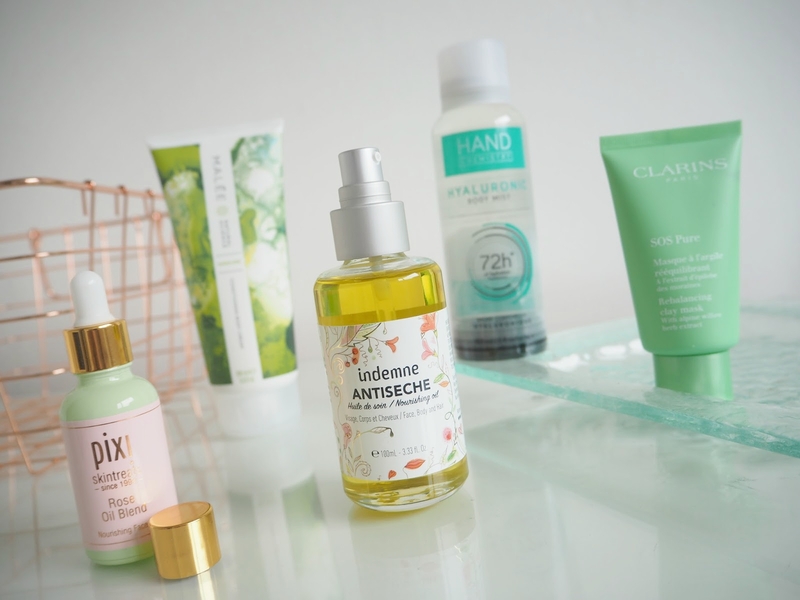 If you're new to the brand, they're a cruelty free, French natural skincare brand and this product in particular is their multi tasking oil for face, body and hair. The oil is made up of 100% natural ingredients including grapeseed oil, sweet almond oil, hemp seed oil and oilve oil to name a few, and notably, no water. It's really nourishing and rich for the skin, yet light on application and it really sinks in quickly. I've been mainly using this for the drier parts of my body; my ankles, knees, elbows, legs for an almost instant hit of hydration - it leaves my skin feeling so comfortable as opposed to dry and tight, and leaves a fresh,delicate scent behind. I also really rate this for using on the ends of my hair to give it a bit of extra shine and condition. And the packaging... So cute, right?! 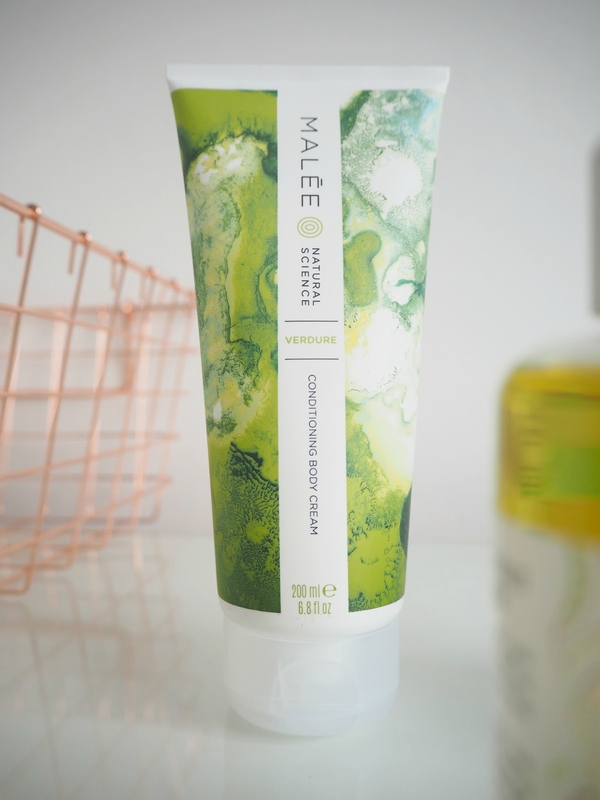 Malee Conditioning Body Cream: Another fairly new brand to me, but one that I expect to see everywhere in the very near future is Malee; a brand who focus on natural ingredients, take inspiration from African scents and use innovative formulas developed by modern beauty scientists. This body cream is my go to right now for using after my daily shower. The cream is thick, hydrating and luxurious, yet completely none greasy and melts into the skin on contact. I love using this in my morning routine, as the citrus and mint scents really power through to give an instant refresh and awakening to the skin, and the shea butter, avocado and sweet almond ingredients work to nourish and moisturise the skin. 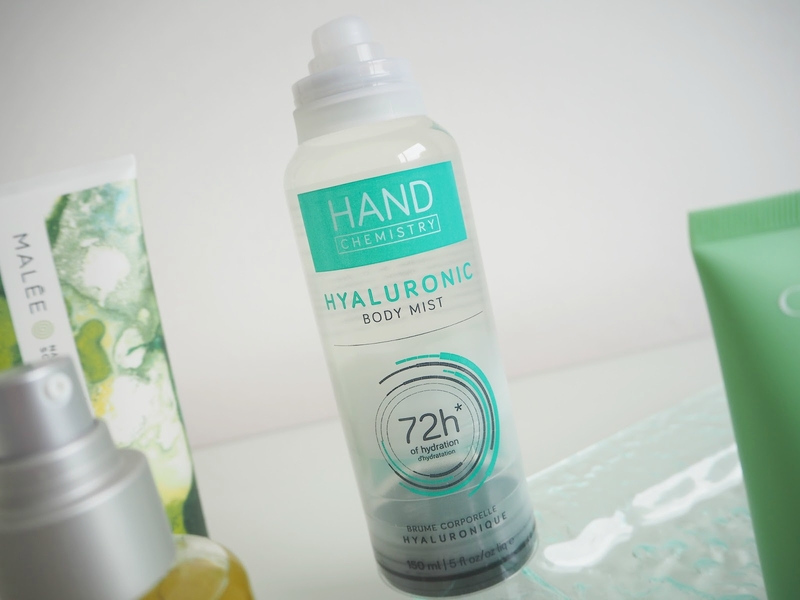 Hand Chemistry Hyaluronic Body Mist: This is one of my favourite products that I have tried so far from the much talked about Deciem, however I haven't seen anyone mention it on their blog before... I really don't know why! This is another product which helps to target dry skin on the face and body, and one that has massively impressed me... It even promises up to 72 hours of hydration. For those who don't have time to moisturise, or simply don't enjoy the whole body buttering step of daily care, then this is perfect for you. The body mist can be sprayed allover the body using it's none aerosol application and rubbed into the skin in a matter of seconds. It has a water like consistency which sinks into the skin almost upon contact. The hyaluronic acid and plant D-glucose get to work straight away, moisturising above and below the skins surface, providing a longer source of hydration than other options. It's also vegan, nut free and cruelty free... I can't wait to try more from this brand. Have you tried any new body products lately? Thank you for this article !! Antiseche is a perfect oil for face, body and hair.